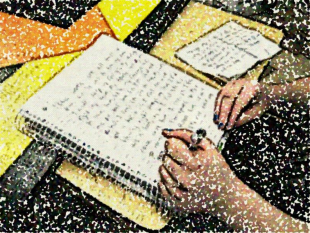 Learning to write, let alone effectively, is a huge challenge for many professionals. I know I struggled during my first few weeks of working for OpenSesame; I was used to writing for an academic audience, so writing for the web was quite an adjustment. For those without any writing experience at all, the challenge is even greater. Whether you write as your career or limit your writing to emails and memos, chances are there’s room for improvement, especially in the efficiency area. So how can you quickly and easily improve your writing? We’ve got the tips to help you unleash your inner writer—whether you want to master emails, copywriting, or another writing skill, we’ve got you covered! Commas join independent clauses. Therefore, “I want to learn to write more effectively, and I want to improve my grammar.” gets a comma, but “I want to learn to write more effectively and improve my grammar.” does not. Always use a comma after the abbreviations i.e. and e.g. “I love veggies—i.e., broccoli, carrots, brussel sprouts, and cauliflower.” Bonus: This example also shows how to use commas in a list! When writing, you have time to think more carefully about your word choice; however, be careful not to overcomplicate your vocabulary. “Based on the fact that” may sound fancy, but a simple “because” is usually better. Watch out for commonly confused words. You may not notice a difference when speaking, but it matters as soon as you write things down! For example: Affect/Effect (verb/noun), Continuous/Continual (without interruption/with occasional interruption), It’s/Its (it is/possessive), or Lay/Lie (put something in a place/recline). Beware business terms and jargon. This language may be appropriate for internal communications, but it may need to be eliminated or simplified for your customers and the public! Inbox bogged down? Spending too much time crafting the perfect email? Write more effective emails and ensure you’re using clear messages. Identify the purpose of your email before you write it. Is it a task, response, inclusion, or FYI? Each of these options is meant to get stuff done—if your email doesn’t fall into one of these, consider whether you need to send it at all. Quality follows quality! If you want to get a quality response, write a quality email in the first place. Provide enough detail (but not too much) and break your information up into easily scannable chunks. Writing for the internet and an online audience comes with a whole separate set of challenges. Most web readers don’t spend long amounts of time on one article, but rather skim and skip around. Your copywriting must cater to this way of reading. Hook your reader and put your essential ideas out there first. You only have your first paragraph to convince the reader to keep going in your article. If it’s not brief and engaging, you’ve lost them to another web page. Break your copy into short, bite-sized pieces with clear, bold headlines. When readers are scanning your writing, they want to be able to pick out the info they need quickly. Lists are a great way to keep readers engaged! When writing marketing copy, focus on benefits rather than features. Benefits are what makes something useful to someone, whereas a feature is a detail about a product. The customer cares more that your brand of conditioner now leaves hair super smooth and moisturized, than that it has new X ingredient. Incident Reports: Include all details. Ensure you have all of the information necessary to come back to review the case at a later date (often in the case of legal action). Your memory is not a reliable source for recalling what happened! Surveys: Statements on surveys must be relevant, concise, clear, use one element (honesty or fairness, not both in the same item), free from double negatives, and actionable. Be specific! Meeting Minutes: Know the needs of your recipients and the context of your notes. If you can clearly keep in mind who you’re writing notes for and why, you’ll be better able to sift through information and only record what you need in a way your intended audience will best understand. Now you have the skills to improve your writing in all aspects of your career! Want to go deeper? Check out the writing category on OpenSesame for great writing tips and training! Do you have any other tips to share? We’d love to hear them in the comments!